IOS smartphones, such as iPhone XS Max, iPhone XR, iPhone XS, iPhone X, etc. are the market hot spots. They are all perfect for watching videos on the go. However, Apple smartphone don’t have the Blu-ray drive and Blu-ray player app for playing Blu-ray videos. That means, if you want to play Blu-ray movies on your IOS mobile anytime and anywhere you like, you will need to rip Blu-ray to iPhone supported video formats like H.264 MP4 or HEVC MP4. To play Blu-ray movies on iPhone XS Max, you need to rip Blu-ray to iPhone XS Max compatible video formats like MP4 first. Acrok Blu-ray to iPhone XS Max Converter (Video Converter Ultimate) is a good choice for converting Blu-ray files to iPhone XS Max playable video files with fast ripping speed and excellent output video quality. What’s more, some video editing features like trimming, cropping, rotating, adjusting video effects, etc. 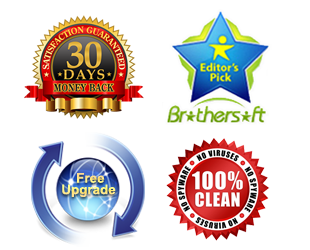 are provided to customize your videos. 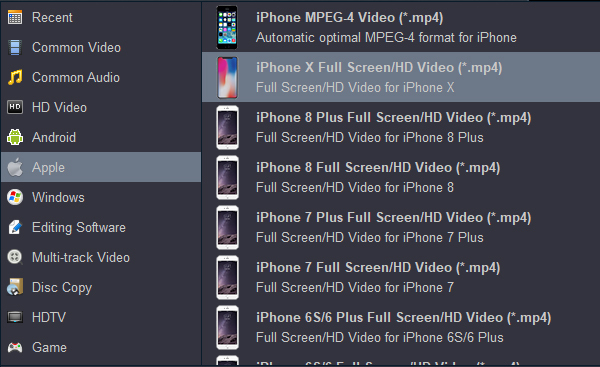 If you are using a Mac, please turn to the equivalent Mac version called Acrok Video Converter Ultimate for Mac to transfer Blu-ray to iPhone XS Max on Mac OS X. Get the iPhone XS Max Blu-ray Ripper now and freely enjoy your favorite Blu-ray movies on your IOS phones like iPhone XS/XS Max, iPhone XR, iPhone X, iPhone 8/7/6, iPhone SE, etc. This quick-start guide uses Blu-ray to iPhone XS Max Converter Windows (Windows 10 included) version screenshots. The way to rip Blu-ray to MP4 on Mac is almost the same. Just make sure you get the right version according to your computer operating system. Click the “Load Disc” button on the top left to add the Blu-ray movie file to the ripper from Blu-ray drive. 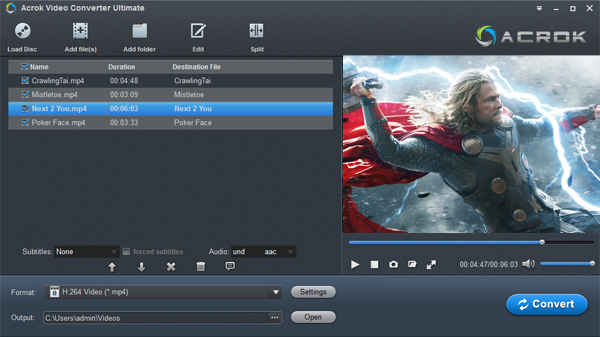 After the Blu-ray files are loaded, you can play them on the right viewing window and take snapshots of your favorite movie scene. DVD and downloaded MKV/AVI/MOV/MTS/MXF files are also supported. For Apple iPhone XS Max, simply choose Apple > iPhone X Full Screen/HD Video (*.mp4) as the output video format. For iPhone XS , iPhone XR and other IOS smartphone/tablet, you can either find the tablet icon and select it as output format or simply choose “Common Video” > “H.264 Video (*.mp4)”. When all the settings are OK, click “Convert” button to start ripping and converting Blu-ray movies to iPhone XS Max best playback format. When the conversion is over, click “Open” to locate the ripped video files. After that, you can sync converted movies to iPhone XS Max via iTunes. Tip: How to sync movies to iPhone XS Max via iTunes? 1.) You need to have iTunes and your iPhone XS Max set to synchronize to your computer with iTunes. See Secrets of iTunes or ask at the Apple Store if you need help; you probably set this back when you bought your iPhone XS Max. 2.) When you connect your iPhone XS Max to your computer, click on its icon on the left side of iTunes. 3.) Click on “Movies” along the top bar in iTunes. 4.) Be sure “Sync Movies” is checked to copy your movies into your iPhone XS Max. How to watch Blu-ray on iPhone 5C?